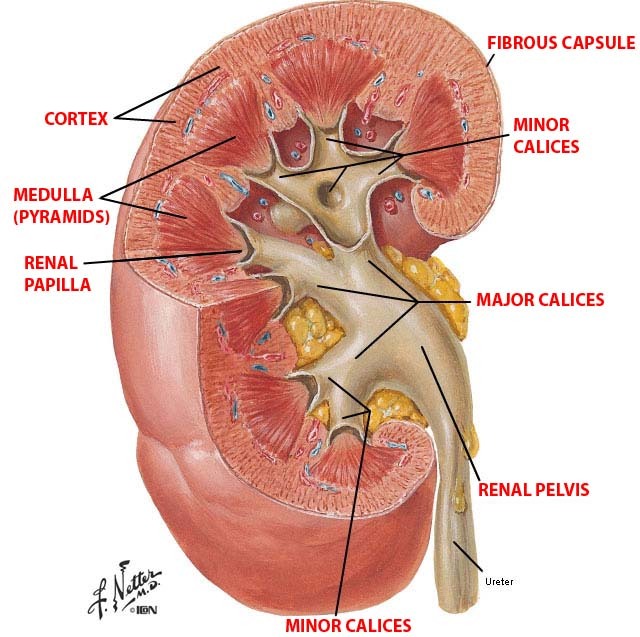 The kidney is a crucial organ for human survival and human flourishing. This organ filters metabolic wastes from the blood and if the kidney does not work, the body slowly poisons itself. When the kidneys fail to work properly, they must be replaced by transplantation of a tissue-matched kidney from a donor. However, if the kidney is not completely damaged, then it might be possible to heal it by means of cell therapies. For example, if we could transplant renal progenitor cells into the kidney that then differentiate into kidney-specific tissues, then we could potentially replace damaged tissues in the kidney and help the kidney fully recover. The tough part of such a treatment strategy has been acquiring a sufficient number of kidney progenitor cells. However, scientists have considered using induced pluripotent stem cells (iPSCs), since these cells can be expanded in culture to very high numbers of cells that can be effectively differentiated into kidney progenitors. Induced pluripotent stem cells are made from mature, adult cells by means of a combination of genetic engineering and cell culture techniques. These cells have the potency to differentiate into any cell type in the human body. Ideally, renal progenitors could be transplanted directly into the kidney parenchyma, but, again, this is not a simple-to-solve problem. “The kidney is a very solid organ, which makes it very difficult to bring enough number of cells upon transplantation,” explains Professor Kenji Osafune. Dr. Osafune’s laboratory is at the Center for iPS Cell Research and Application (CiRA) at Kyoto University, Japan, and is using iPSCs to investigate new treatments for kidney disease. Several studies have successfully transplanted adequate numbers of kidney progenitors to treat kidney disease. In a new study, Dr. Osafune has collaborated with Astellas Pharma Inc., in order to potentially design a solution that can solve the problem of treating the kidney with exogenous cells. In this study, Osafune and his colleagues tried a different way to deliver the kidney progenitor cells. 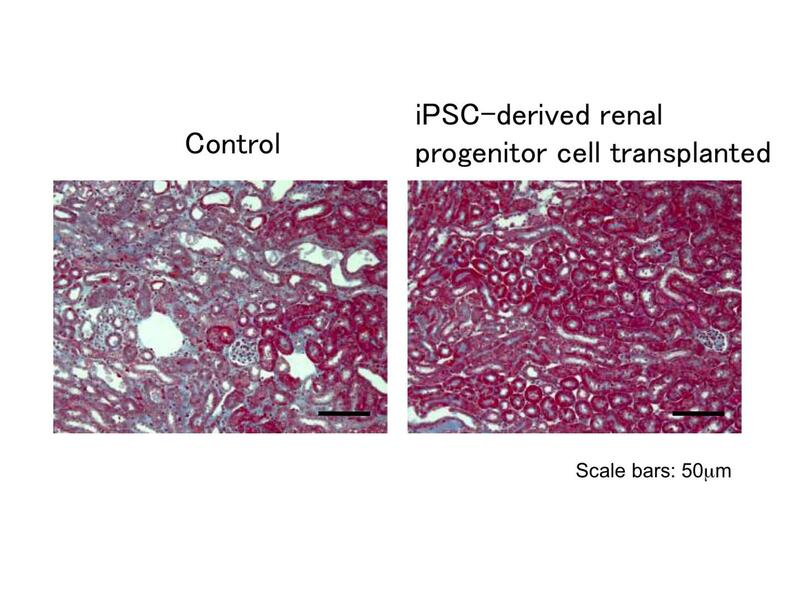 Instead of injecting cells directly into the kidney, they transplanted their iPSC-derived renal progenitors into the kidney subcapsule that is at the kidney surface. The mice that received the cells were suffering from acute kidney injury. Even though the transplanted cells never integrated with the host, mice that received this transplant showed better recovery, including less cell death (necrosis) and scarring (fibrosis) compared with mice that received transplants of other cell types. Damaged kidney tissue (left) of an AKI model mouse shows high levels of fibrosis (blue). Treatment with Osr1+Six2+ cell therapy significantly ameliorates the fibrosis (right) of another AKI model mouse. Osafune attributed the improvement in his laboratory mice to the use of cells that expressed the Osr1 and Six2 genes. The Osr1 and Six2 proteins are known markers of renal progenitor cells, but until this particular study, researchers had not exclusively used cells that expressed both of these proteins for cell therapies. From: Takafumi Toyohara, et al., “Cell therapy using human induced pluripotent stem cell-derived renal progenitors ameliorates acute kidney injury in mice” Stem Cells Translational Medicine.